Fortified with anti-oxidant rich organic cannabis )hemp) seed oil, rejuvenating aloe leaf juice and quick-absorbing jojoba oil to leave the skin healthy and hydrated. Apothecanna is a natural botanical research company that formulates artfully crafted organic herbs and essential oils into high quality topical creams that promote healing and good health. Apothecanna products are artfully crafted in small batches in Denver, Colorado without the use of artificial ingredients, fillers, parabens or known toxins. into their formulas which are rich in nutrients and essential fatty acids. Cannabis seed oil helps hydrate skin and improve absorption of other botanical extracts that help aid our bodies in feeling better. Unlike the flower oil, cannabis seed oil does not produce a high or show up in drug tests. Apothecanna will be introducing three different types of massage lotions on April 20th at Thompson Alchemists in Soho, NYC. The calming creme contains lavender chamomile, frankincense in a natural base of organic aloe barbadensis leaf juice, cannabis seed oil, and other organic oils to make a smooth functional massage lotion. Use after physical activity and before bedtime to melt away tension and stress. Use anytime to relieve irritated or inflamed skin. Apothecanna’s pain creme contains arnica, peppermint, juniper mixed with oil pressed from seeds of low thc containing cannibis plants that are high in Omega-3 fatty acids. This cooling massage lotion is packed with powerful plant extracts that provide fast acting relief from pain and irritation. Your skin will feel nourished and restored with 100% plant based ingredients. Finally, Apothecanna’s stimulating creme is a blend of ginger, capsaicin, grapefruit and cannabid extracts that rejuvinate tired muscles and joints. Apothecanna’s stimulating cream contains energizing plant essence that invigorate dry, dull skin and provide a natural pick-me-up with 100% plant based ingredients. Massage Apothecanna’s stimulating lotion into sore hands, stiff joints and tiered muscles. 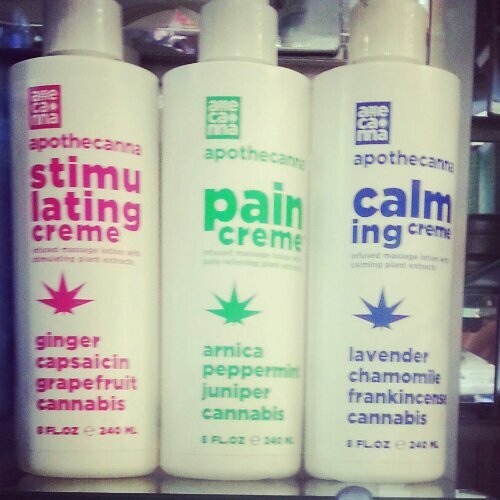 We hope you enjoy Apothecanna’s botanical healing products. Please stop by Thompson Alchemists for more information on this new natural product line.